Blog > Instagram > Can Instagram Ads Be Effective for B2B Marketing? For a very long time, Instagram has ruled as a user-to-user social network. Historically, few brands have been able to capitalize on the platform, due to the high barrier to entry. You needed to upload posts via the app, as there were no desktop management suites. It didn’t tie into any existing social media management platforms. There was no scheduling or API access. Over the last few years, however, Instagram has become increasingly friendly towards brands. They introduced brand/commercial accounts, paid advertising, and even the recent Instagram Marketing Partnerships that allow third party developers access to their posting API. 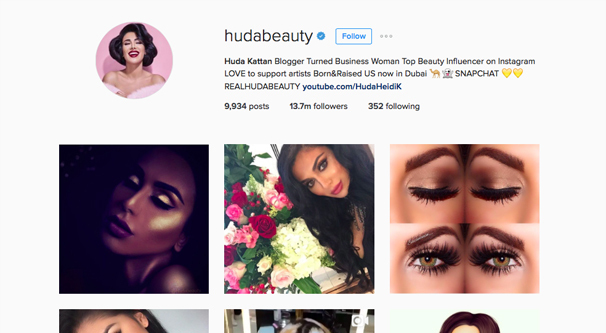 As such, over the past few years, an increasing number of brands have been moving into the Instagram space. It’s become easier and easier to operate a brand account, while the engagement and utility of the platform has remained higher than any other social network, even if it has been dropping. These things tend to work in stages. A social network starts up as a C2C, or customer to customer platform. Regular users doing regular user things, with some advertising or monetization from the platform itself as an effort to stay afloat. Brands start to move in, and the platform takes advantage of that fact, allowing those brands to monetize while taking their own cut. As brands move in aiming to capitalize on the B2C opportunity, other brands move in looking to capitalize on that new audience. The B2B brands find their place in the ecosystem, using other brands as their target audience. 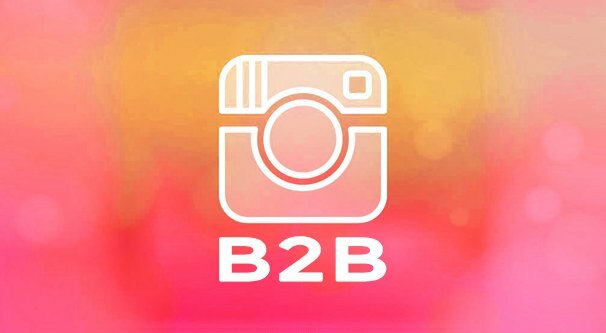 Is B2B effective on Instagram? I would say so. I’m not alone, either: according to a study performed by the Content Marketing Institute and MarketingProfs – and sponsored by BrightCove – 30% of B2B companies have established a successful presence on Instagram. If you operate in a B2B space and are considering Instagram, I’ve got some valuable information for you. First, I’ll give you advice and ideas of how to use Instagram effectively, then I’ll show you some examples of brands taking advantage of the social network. The first thing you need to do, if you’re considering moving into the B2B Instagram space, is to determine if your target audience is present. Instagram is a massive platform with a billion monthly active users. That’s an incredible number of people, but the vast majority of them are consumers. They’re not brand accounts or people operating businesses, which are your target audience. Some industries are simply more represented on Instagram than others. A local plumber isn’t really likely to have an Instagram account, since their job isn’t very glamorous, and users aren’t likely to be looking on Instagram to find a plumber. Therefore, a plumbing supply company looking to market to local plumbers isn’t very likely to find their target audience on Instagram. On the other hand, a lot of industries are well represented. Health, wellness, beauty, fashion, apparel, athletics, and other sorts of active, photogenic industries are quite prevalent. If you’re a B2B brand that operates in that kind of space, you’re quite likely to find your target customers on the social network. 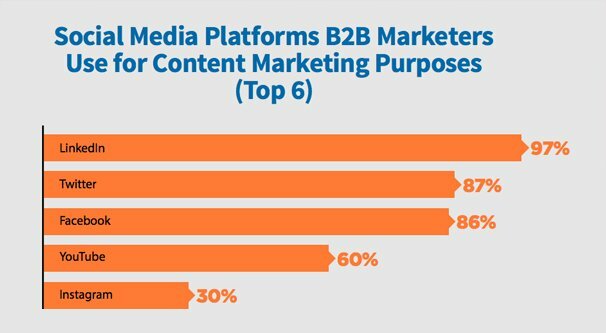 Second on your list is to figure out your Instagram B2B strategy. You’re not likely going to entice business owners just based on a few pictures of your storefront. There are a few ways you can approach a content strategy. Thankfully, they’re mostly the same as B2C marketing. Show company culture. Large brands like IBM or Wells Fargo can show a peek behind the curtain. Sure, they’re massive, global brands, but even massive global brands are powered by people. These companies can use their Instagram feed to humanize and show the people behind the brand. Customers, either B2C or B2B, want to purchase from companies they like and trust. Showing a glimpse behind the curtain is a good way to build that trust. Share user generated content. You can showcase both user content involving your brand, or user testimonials about your brand. Apparel companies, for example, can show customers happily enjoying their products. Something like a bank could share stories from customers about how that bank’s loans helped them start a successful business of their own. Enhance employee voices. Your employees are people with their own interests and activities outside of work. When they have something interesting to share, be it a sports league, a charity advocacy, or anything in between, you can enhance their voice with the power of a corporate account. It’s another way to humanize your brand and bring about a better corporate perspective, as well as supporting your employees in their endeavors. Showcase new products. 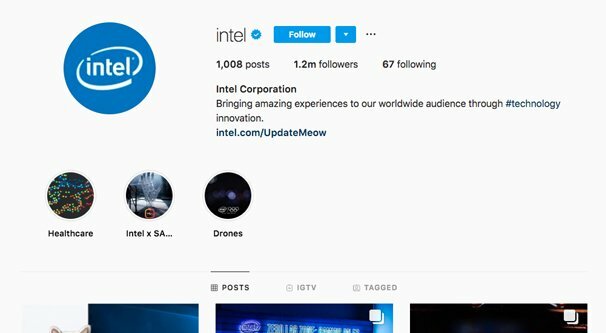 Instagram’s visual platform is excellent for infographic-style breakdowns of new products or feature launches. Mailchimp is great at this, with clever styles and visual metaphors to explain what would otherwise be a pretty dry, corporate feature list for a mail program. Showcase existing products. Just because it’s a B2B product doesn’t mean it can’t be glamorous. 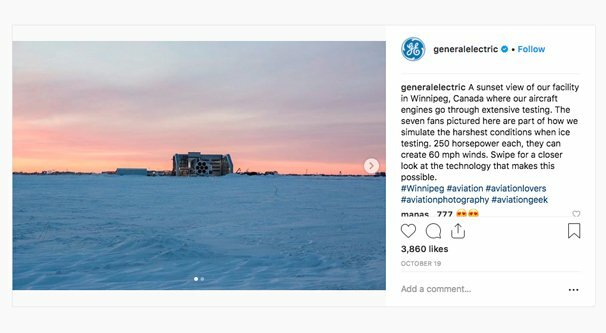 General Electric (GE) is quite good at showing their industrial machinery in a clever, photogenic way. Just check out this photo of a facility or any of the many photos of their wind turbines. Industry can be quite visually striking. The reality, of course, is that you’re probably going to want to do a mixture of all of these. No one concept will fill an entire account, and if you stick to one concept too closely, your imagery and photography will grow static. You’ll lose out because of the lack of variety as much as anything else. When you have a strategy and you’re starting to market on Instagram, you need to pay attention to your analytics. Instagram’s business analytics are quite good, but you can also use analytics from third party companies, specifically some of those marketing partners I linked to way up at the start. Use analytics and iterate on what works. The best laid plans can totally fall flat, while a goofy meme reference can catapult you to viral stardom; the internet works in mysterious ways. The best you can do is put out enough content in enough different spheres that something is bound to catch on. There are, of course, dozens of brands on Instagram marketing in a very successful way. I’ve put together a semi-random selection of brands that have good imagery and strategies that work. Remember, while you’re looking at these examples, that they all have one thing in common: excellent imagery. The number one key to success on Instagram, regardless of who you’re targeting or what industry you’re in, is powerful visual imagery. You want images that stand out in a feed, whether that’s a user’s feed or a hashtag feed. If you’re not publishing high quality images, you’re not using Instagram properly from the start. 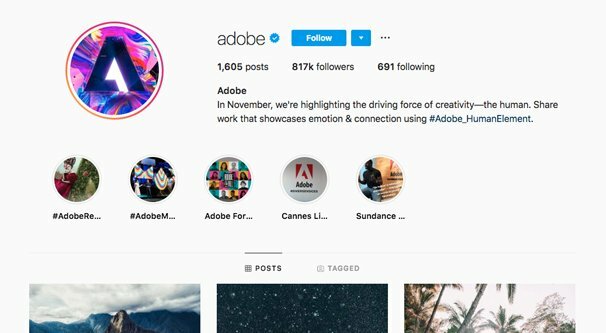 Adobe is very well positioned to make use of Instagram because, as developers of a very well-known and well-used creative suite, they have an incredible wealth of potential content. You see this in action on their feed. Everything form photorealistic manipulations to graphic design to edited videos fill their feed with color, fantasy elements, and more. Adobe’s products are aimed at everyone from students and artists to big-name brands with million-dollar creative budgets. As such, their feed showcases everything from simple graphic design to detailed manipulations. Most importantly, though, everything they share can be accomplished using one of their program. Adobe’s feed serves double duty as well. In addition to showcasing the power of their creative suite, they also serve as inspiration for those in creative fields. Those who already own Adobe products can come back time and again looking for ideas. Intel being a computer hardware manufacturer doesn’t seem like it would be very visual, but they have a ton of branding work put into their content. They show pictures of people using their technology, pictures of their presence at trade shows, showcases of their new developments in technology, and more. Some of their more interesting content showcases graphical representations of the theory behind the tech, or creative uses of that tech in action. Intel also partners up with other brands for content promotion quite frequently. For example, this post is a showcase of VR powered by Intel technology, in partnership with the Smithsonian. Intel doesn’t just look to the future; they look into the past as well. This photo, for example, shows some interesting historical content relevant to computation, as well as following the trend of International Women’s Day. 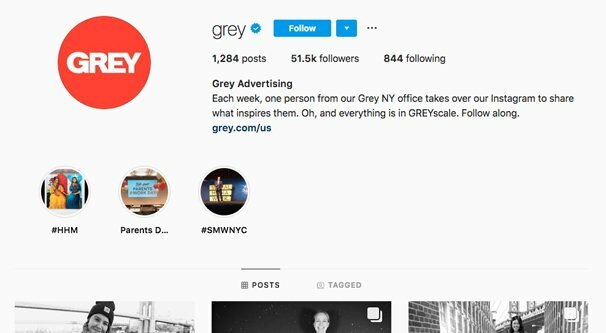 Grey Advertising is an advertising agency based out of New York. As an advertising agency, they have a keen grasp on the power of visual imagery. They aren’t advertising directly to their customers, however; instead, they’re just showcasing what they can do and letting customers come to them. The gimmick of the Grey account is quite interesting as well. Each week, they rotate the employee in their office in control of the account. A wide variety of styles, perspectives, and content is shared on a weekly basis, through 1,200 posts and counting. With such eclectic styles, it seems difficult to maintain brand representation, but everything is unified with a single gimmick: every post is grayscale. Scrolling back a few weeks, you can see a wide variety of styles at play. One employee focuses on city landscapes, while another takes photos of people and adds the answers to a question over each. One takes photos of architecture and statuary, while another looks at the grungier side of the city. The same location, but wildly different perspectives. Fedex is a global delivery brand, and while their product – shipping from place to place – isn’t exactly glamorous, the locations they visit very definitely are. Their account showcases just about everything I mentioned above. They have very colorful imagery, glimpses of employee lives, capitalization on current trends, a showcase of their charity as a brand, and a whole lot more. Every image they post has one commonality running through it: something branded with Fedex is in the picture. Most of them have an image of a Fedex plane or truck in the picture, but others are more subtle. Photos of homes and pets have a carefully positioned Fedex box somewhere in the frame, while photos of employees and their families tend to have someone in uniform visible present. 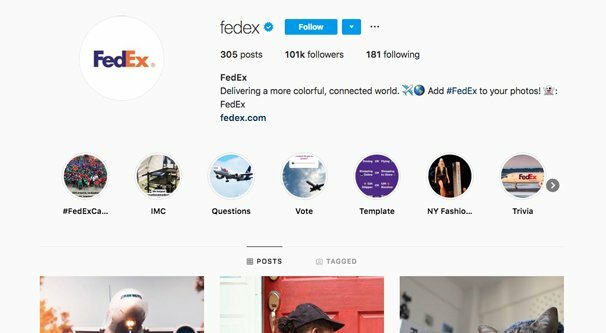 Interestingly, Fedex isn’t a very active brand on Instagram. They have a few dozen posts from this year, picking up more in the last few months, but it’s easy to scroll a few lines down and run into posts from 2016 or earlier. It just goes to show that even global brands can come and go with their focus on varying social networks. Microsoft has long since reached a point of saturation where they don’t really have too much of a need to advertise. After all, they have such a monopoly over so many areas of business software that advertising is basically superfluous. 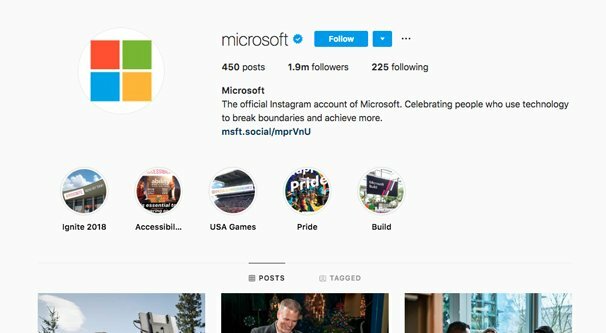 Instead, to distract from their monopoly and humanize the brand as a whole, Microsoft makes use of their platform to showcase the people who use technology, and the other brands that put it to use to help people. The wonders of technology bring you glimpses into the cutting edge of particle physics, or a graphically vibrant look at data visualization, or support for social movements. The moral of the story is that brands both large and small can find a home on Instagram, whether they’re B2B or B2C. There’s room for everyone, and an audience for us all, if we just know where to look.